When I first saw promo pictures of the OPI Germany collection I quickly dismissed them. I really wasn't thrilled with any of the colors, and found them rather boring. Promo pictures lie..especially OPI ones..at least to a degree. When I saw these polishes in person and on other blogs I changed my mind a bit. I was right, many of the colors did not move me, but the vampier colors did, especially Every Month is Oktoberfest. Every Month is Oktoberfest is a deep red-toned purple with a beautiful glowy red/purple/golden shimmer. This is stunning. The shimmer in this just glows from within. I love how you can see the different toned shimmer particles in this when it touches the light. It really gives this polish so much depth and dimension. It is a real winner for me, and from what I've read it's a winner all around from many bloggers. That being said, I'm calling it a must have. I think this is also a very flattering shade on many people. If you don't have this polish already, I suggest you give it a try! This is a stunner!! I love it! This does look like a winner! This one is absolutely gorgeous. It's the only one I picked up from the collection. This was recently gifted to m by my colleague - I am so happy to have it! It looks perfect on you Steph! This is my favorite color from the Germany Collection- I never cease to go "oohhh..pretty" when I see it! Why, why (kicking myself) didn't I pick up this one in my order? This is a beauty - I only wish the glow it has showed up more in low light. I tend to loose the 'goodies' this lovely has except when really good light. Other than that, I really love this one - I did not want this to be an in your face glow but so would like it to show up to others and not just have it be one only I know that it's great. I need to play still and find some toppers or something to mid layer it with so maybe I can beef up that amazing glow it has. I felt the same way about this collection; it didn't wow me until I saw a few of the polishes in person. This is beautiful! I've heard other people say it, but this is going to be one of those VHTF OPI polishes that everyone wants, like AA and MAAH, etc! I'm glad I picked this up, cause it really is a gem! It's sooo gorgeous, i really need to try it on soon - thanks for swatching it! 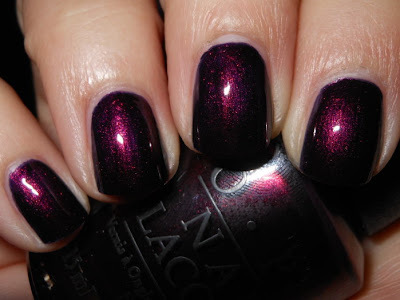 Gorgeous and rich color, just what I love for this winter! SO gorgeous! I should just get it already, lol. And I totally agree about OPI's promo pictures.